From rolling hills of vineyards to small dairy farms, to proximity to the river and coast, Oregon’s wine country real estate offers something for all, including downtown streets — lined with maple trees– that bring back a quieter, calmer, nostalgic time with plenty of shops, eateries, and B&Bs. More than 200 wineries and vineyards dot the rolling landscape separated from Portland proper by an urban growth boundary. So in just an hour or so away form your home, you’re out of the hustle and bustle and into the middle of loveliness, fresh air, acres of wildflowers, canopied forests, and wineries galore. Family vegetable and berry farms and small-scale dairies and creameries with succulent cheeses bring a whole new meaning to farm-to-table. Wine Enthusiast magazine name the Tualatin Valley — located in the heart of the North Willamette Valley — the 2016 Wine Region of the Year. See the magnificent vineyards of Oregon, where you’ll find lush estates tended by families who are passionate about growing the best wine grapes and freshest foods. From very rural small town small city, but they all share one thing in common — genuinely friendly residents who welcome all. World-class wineries and vineyards are at your doorstep, where you can take chauffeured tours, view them from a helicopter and taste galore. Downtown streets, lined with maple trees, bring back a quieter, calmer, nostalgic time with plenty of shops, eateries, and B&Bs. The river’s not far away, but is far less crowded than in Portland, so it’s easy to boat, tube, and waterski. The cities enjoy proximity to the gorgeous Oregon Coast, casinos and live entertainment, and there are a plethora of arts and cultural activities. 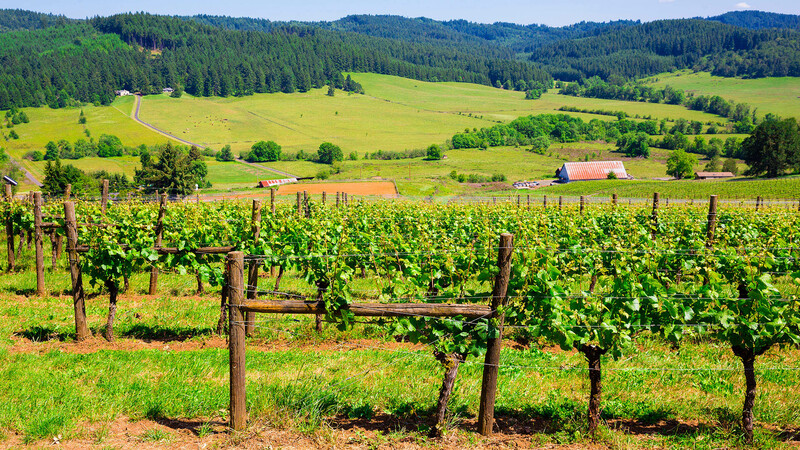 There are countless opportunities to own real estate and live in Oregon’s wine country. Most homes have larger lots and mature landscaping and can be had a fraction of the cost of in-city living. The average home price ranges from $234,300 in the smallest of communities to $414,200 in a mid-sized area and all enjoy a lower tax rate.